Let’s start by pointing out that my oven is still very questionable. I had noted that when the oven hit it’s desired temperature – quite accurately, I’ll add – it decided that’s all it needed to do. It no longer kicked in to keep the oven temp at that level. So without knowing, the oven temperature would drop and drop and drop, all while the digital readout still said “450°F” as the inside plummeted to 350°F. “I’ve baked a few things” said Punkin, pulling a Shepherd’s Pie from the oven a few days ago, “I think it’s OK again. I suspect it’s your steam that’s causing the problem.” OK, so maybe the steam is playing havoc with either the thermostat inside the oven or the actual chips inside the oven controls. So I figured, after a few weeks of not baking and staring to have serious withdrawals, I would give it another go. So with that I decided to give a go at one of our July breads on MellowBakers.com and tackle the very well received Potato Bread with Roasted Onion from Jeffrey Hamelman’s Bread: A Baker’s Book of Techniques and Recipes. 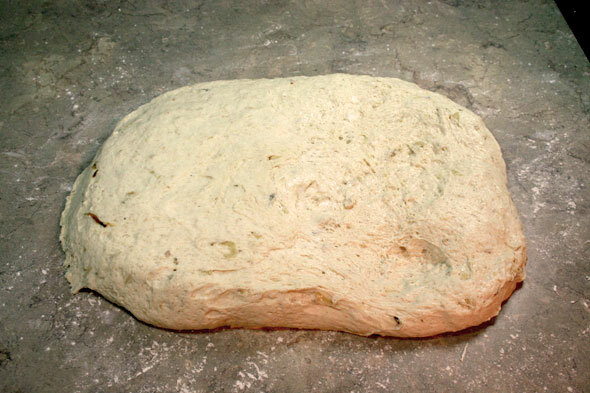 Gathering all the required supplies I then set off to make this loaf, hoping the oven had got over its little fit. 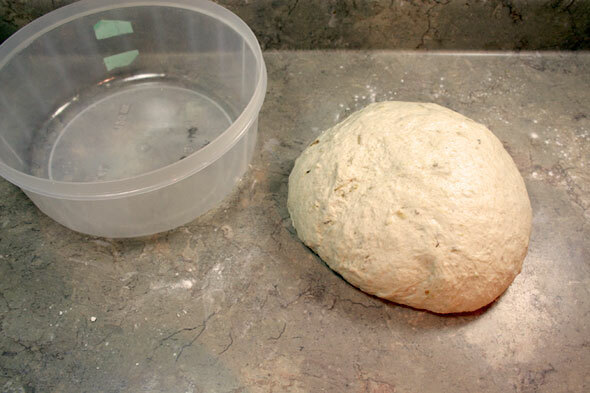 I would also steam the bread by putting it under pans to trap the water instead of steaming the oven cavity. That will rule out the “steam in the works” problem. 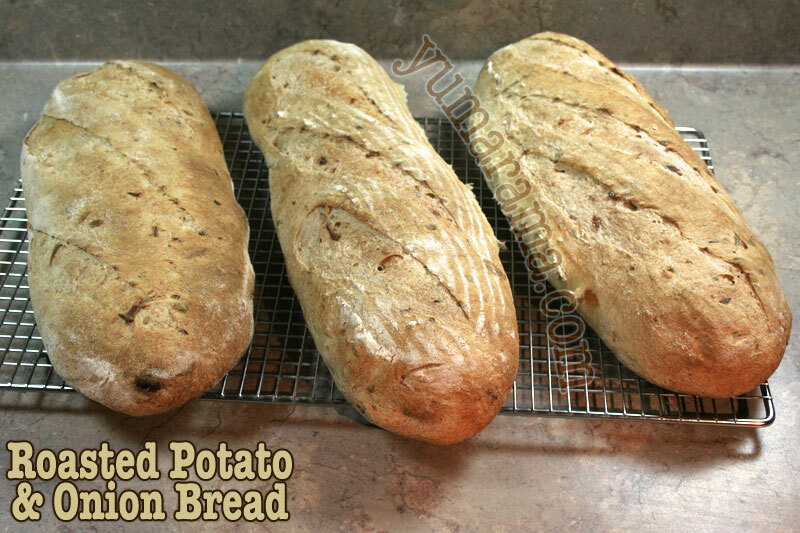 Other than adding potatoes and onion, this bread is pretty straight forward, although preparing these veggies does take a little prep time. 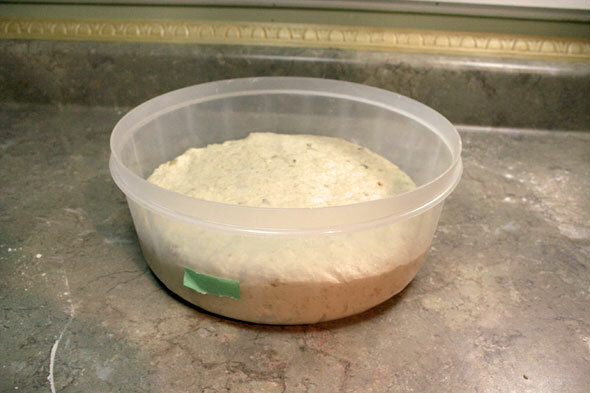 Since the bread also uses a pre-ferment, you do need to star things up the day before anyway. 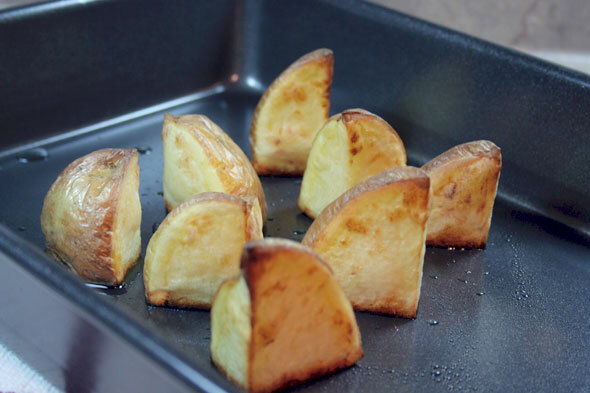 We need to roast the potato and onion some time before hand as these need to be cool when they go into the dough. 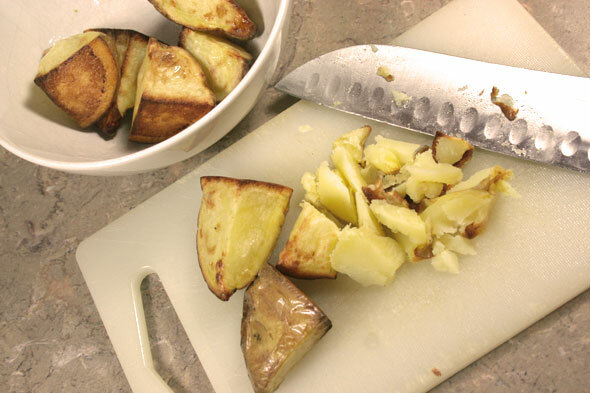 Although the book seems to suggest it should be left whole, I cut the potato into small chunks in order to speed up the roasting process a bit. 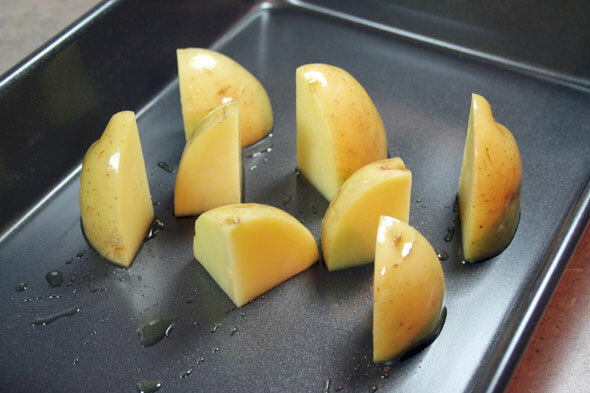 The potato is then drizzled with a little EVOO, placed in a roasting pan which goes into a 400°F pre-heated oven. They were in for about 30 minutes and came out quite lovely. Almost had an urge to sprinkle a little salt and pepper on them and just eat. But I resisted. Letting them cool a little, I chopped them coarsely and set them aside. 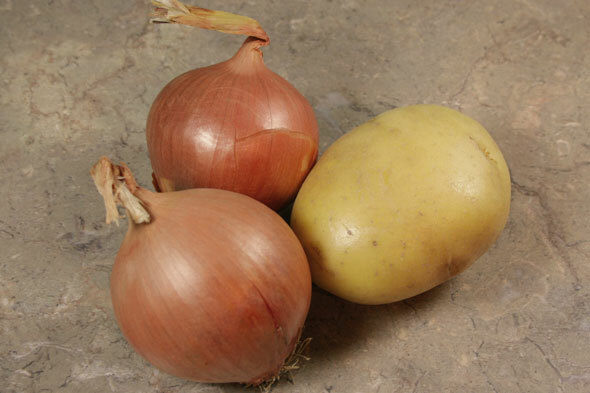 Next, we tackle the onions. 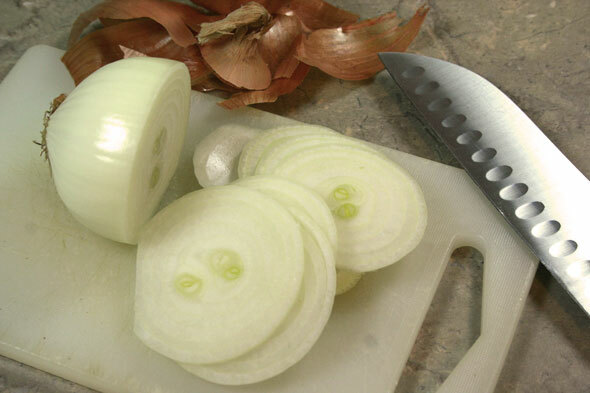 Thinly sliced, I chopped each disk once or twice to make slightly smaller lengths. Again, drizzled with a little EVOO but “just enough to coat” warns the book (we’re not deep frying here), they too went into the 400°F oven, They stayed in for about 20 minutes, checking every 5 or so and giving a stir in the process. 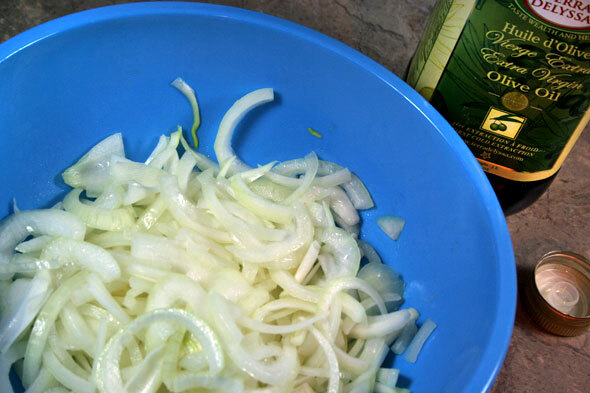 I dodn’t take a photo of the final result but you can see these golden brown onions in the Mis en Place photo below. 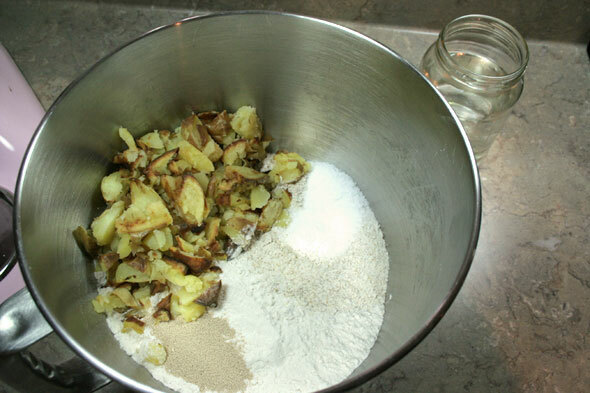 A somewhat simple set of ingredients: Counterclockwise: whole wheat flour, bread flour, salt and yeast, the roasted onions and potato and in the centre, pre-ferment and water. The pre-ferment was mixed up the evening before and left to proof for 16 hours at this point. All the ingredients except the onion and pre-ferment go in and get mixed for about 3 minutes until incorporated. 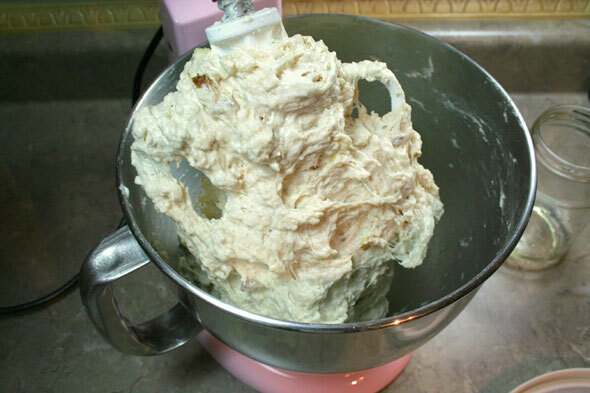 I switched to the dough hook and added the pre-ferment, stopping the mixer every minute or so to drop a spoonful of the mixture into a gap and to the very bottom of the mixer bowl. I did just add a bit on top at first but this caused the dough to crawl up the dough hook so I went with the deeper drop in for ease of adding. The dough hook did a fine job of kneading the dough but I found this mix quite wet still, after 5 minutes of using the hook and before adding the onion. 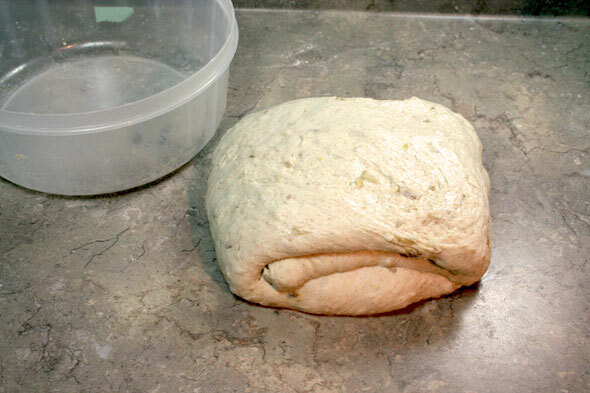 So I gradually added more flour to stiffen the dough somewhat, a little after the hook photo above was done. At the end, I added the onion (not seen here) to the dough and mixed just until well dispersed. 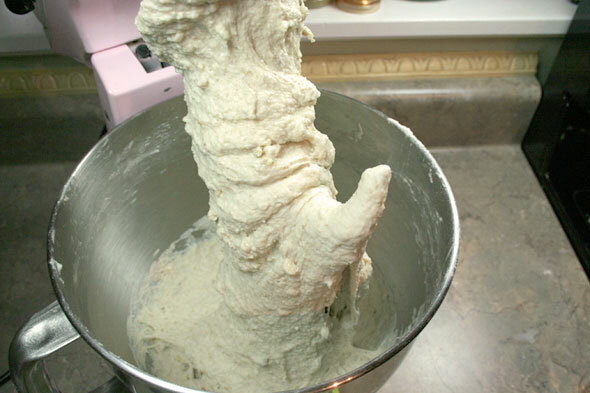 Even after 7 or 8 minutes of mixing and extra flour, the dough was still a little too wet. 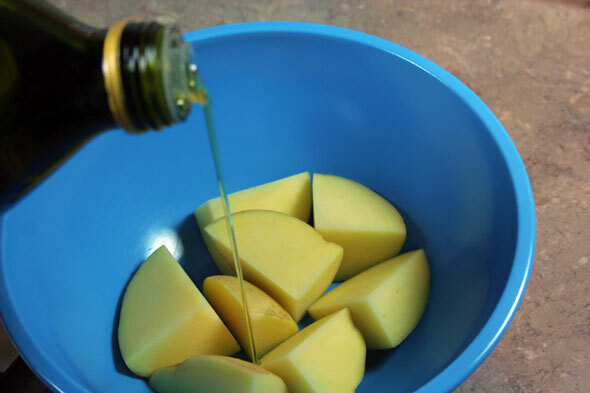 Hamelman states that the dough at this point should in fact be relatively dry and stiff as it’s expected the potato and onion will add wetness. But even before the onion, the dough was very sticky. So at this point, I turned out the dough and kneaded by hand for a bit and added a little more flour so it was easier to handle. 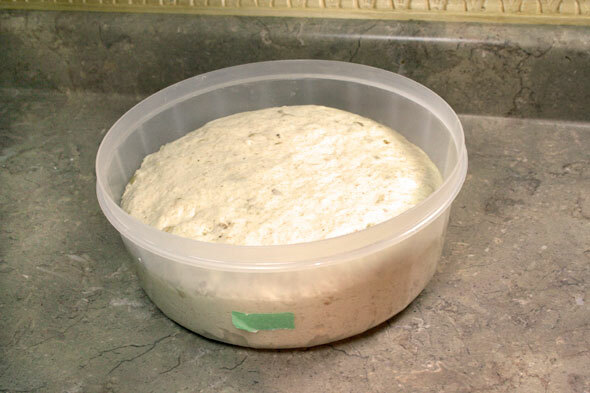 Once kneaded and not quite so sticky, I balled up the dough and put it in a greased bowl to proof for 45 minutes, when it would get one stretch and fold. Back into the bowl it goes for another 45 minutes. 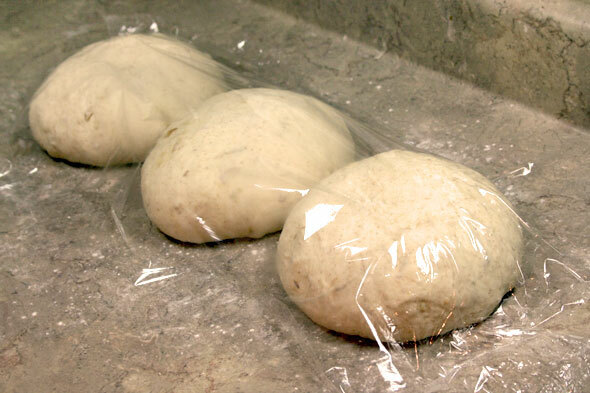 Once the bulk proof is done, the dough is turned out and pre-shaped into dough balls and covered to rest for 10 to 20 minutes. 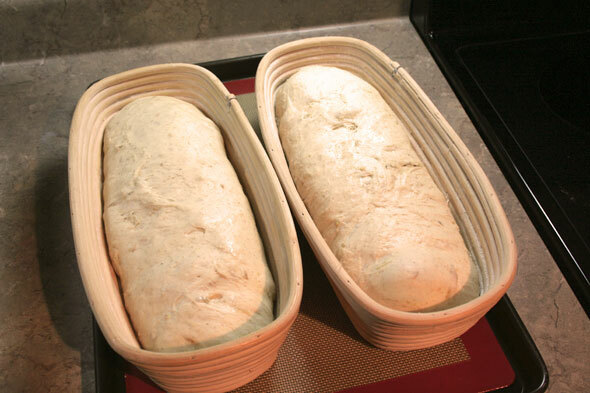 I selected my two banetons and making a free-form loaf on the couche as today’s bread shapes. 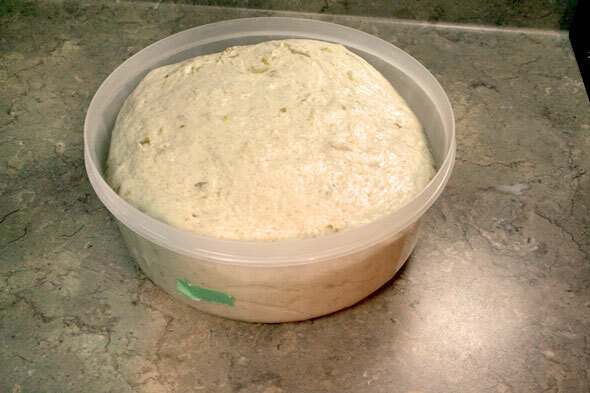 The dough was covered and left to rise for 1 hour & fifteen until about doubled. Meanwhile, the oven is pre-heated to 450°F. 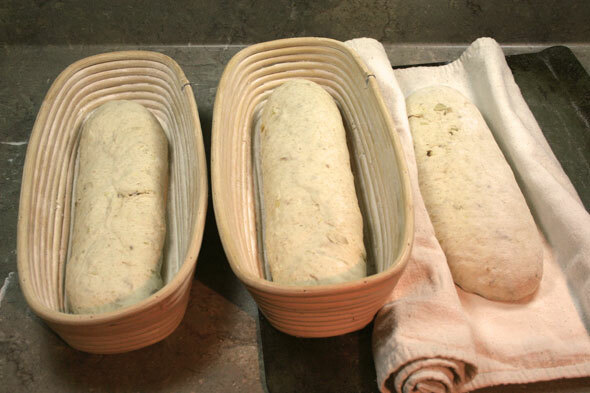 Once slashed, the bread goes into the oven for about 40 minutes. I placed the loaves on baking pans and covered with big aluminum turkey pans to trap the steam and removed them after 5 minutes and let the loaves bakes until they reached 30 minutes. I removed the loaves and checked the internal temp: 200°F+ so it was time for them to come out even though the crust was a wee bit pale. 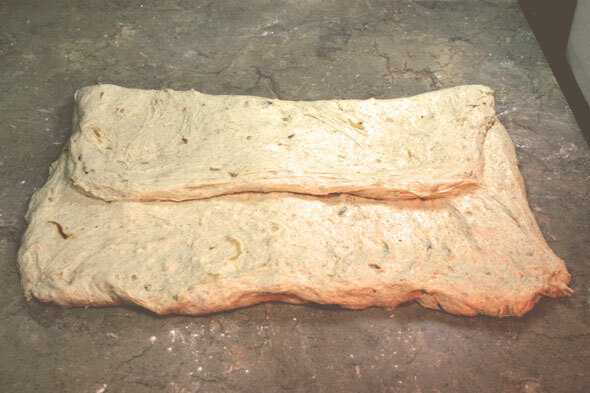 Here are a couple of shots of the final bread. 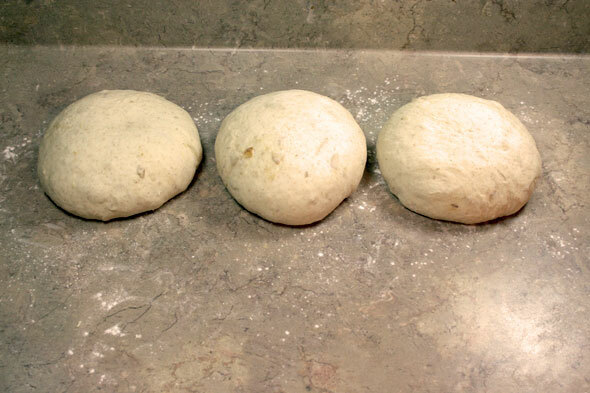 The one on the left was the couche loaf, the middle one had a wee accident getting on the pan; it fell and landed on the pan’s edge and stuck pretty good when I tried to move it over so a little deflation deformity here, although it got back a nice bit of spring. The slashes didn’t come out all that great, perhaps due to this having potato in the dough or maybe I did not slash well, going down as opposed to angled in. And/or the fact I started these out under pans to self-steam. And in case you were wondering if the oven had indeed “fixed itself” the answer is “no”. After loading the bread in, I kept an eye on the oven’s thermostat reading to make sure all was well BUT the oven read 450°F all along even though the thermometer I had attached in the oven was showing a steady temperature decline. I eventually noted the discrepancy (after the loaves came out from under the domes) and re-started the oven: 375°F the oven said as it began ‘pre-heating’ again. The crumb isn’t too holey, in fact rather even holes; that’s the potato at work. 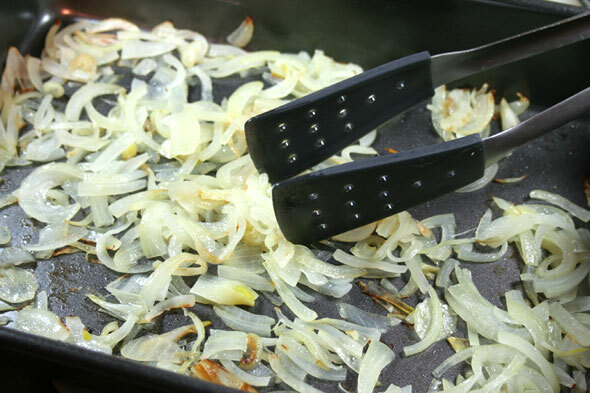 The onions show as small specks throughout – I’d forgo the “thin slices” idea next time and get slightly bigger chunks. Visuals aside, this is really excellent bread, especially after cooling just 15 to 20 minutes where it’s still warm enough to melt a little butter… Mmmm Mmm!! So sorry you’re still having oven troubles! 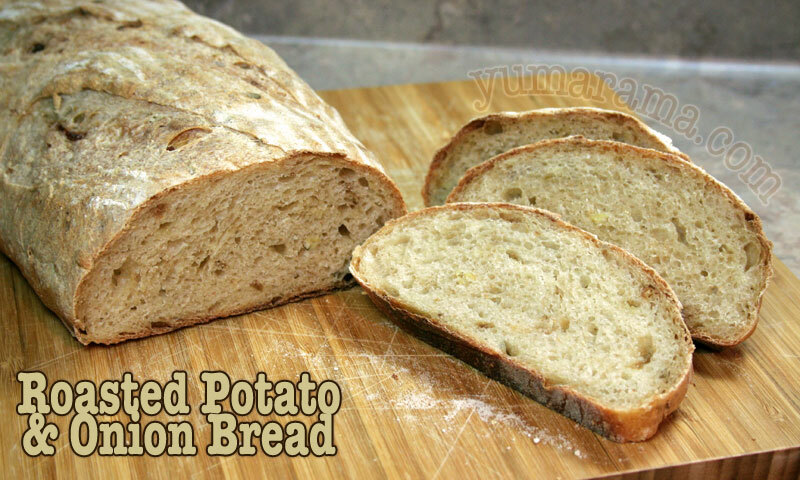 =( The bread looks delicious, even so, and makes me want to bake another loaf right now! To have troubles with the oven is really bad! It drives me nearly crazy when our oven had problems with an internal fuse and I couldn’t bake for two weeks. I cross my fingers that you find the problem soon! The bread sounds really delicious, something I would love to serve at a barbecue! 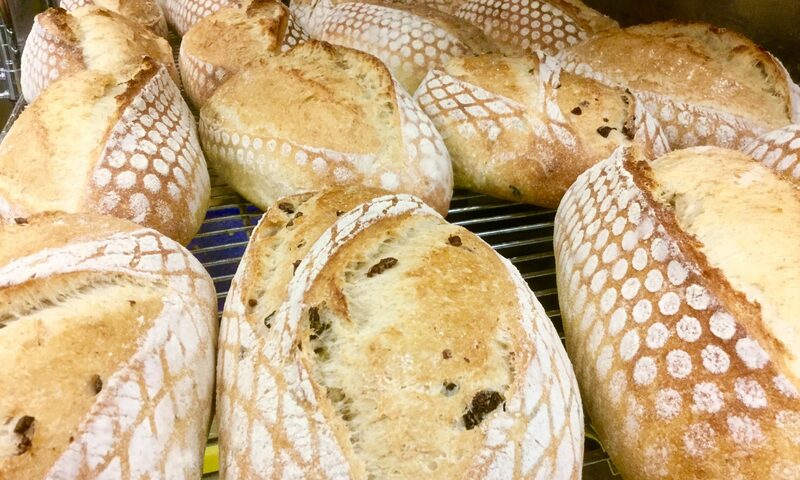 Wonderful looking loaves! 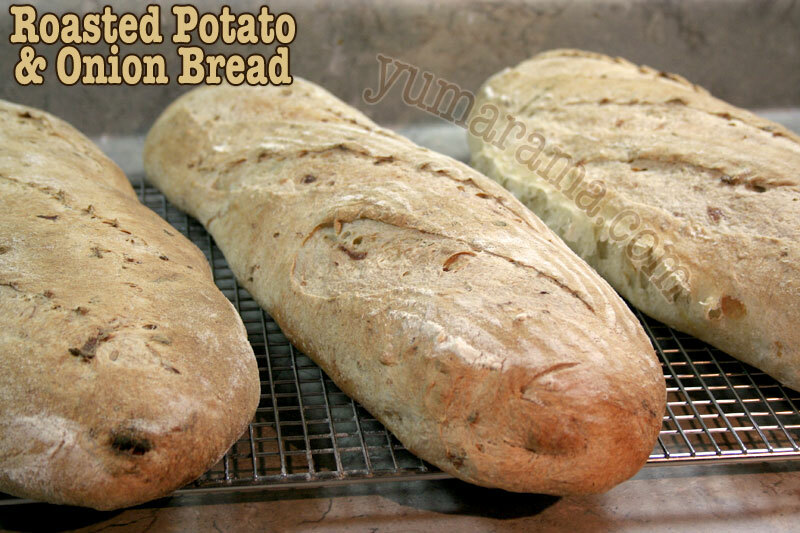 Yes, mine were a bit paler than alot of my other breads, but it does taste great. 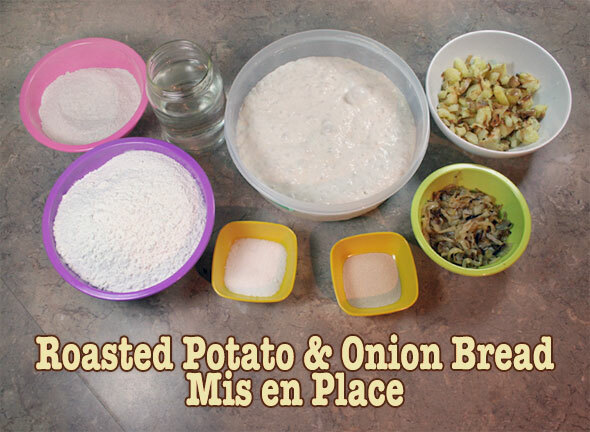 I couldn’t see the potato or the onion in my sliced bread, so if I make again I think bigger pieces of potato and, like you say, bigger chunks of onion might be used. This bread sounds pretty amazing. I wonder if I dare try baking it in our barbecue. Elizabeth recently posted…Remind me to put bananas on the grocery list!